Most Americans think Medicare is worth the cost to taxpayers, according to a new CBS News/ New York Times poll, but Republicans are split on the issue. However, when asked whether the government has a responsibility to provide health coverage to the elderly, most Republicans say it does. The new poll, conducted April 15 -20, underscores the politically risky step House Republicans have taken by endorsing a 2012 budget plan from House Budget Committee Chairman Paul Ryan (Wis.), which would dramatically transform the Medicare program. At the same time, the poll shows that most Americans think it will be necessary to make changes to Medicare in order to reduce the budget deficit. Additionally, nearly half of Americans said they could tolerate some cuts to the program to reduce the deficit. Ryan's plan promises to cut $389 billion in Medicare expenses over 10 years, largely by indexing the growth of Medicare to inflation. And starting in 2022 under the proposal, seniors entering Medicare would be given limited "premium support" to cover the cost of coverage from private insurers instead of the current government-run health coverage. Ryan's plan would also change Medicaid, which serves low-income families, from a government-run insurance program to a system of block grants distributed to states. While conservatives have praised the plan for confronting some of the nation's largest deficit-drivers, liberals have decried the proposal, saying it places the burden of deficit reduction on the poor and elderly. President Obama has said deficit reduction is necessary, but at a town hall event yesterday, he criticized the GOP's budget plan as one that "is fairly radical" and not "particularly courageous." 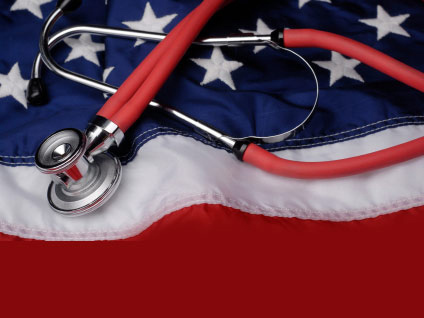 According to the new poll, 61 percent of Americans think Medicare is currently worth the costs. As many as 78 percent of Democrats and 57 percent of Independents say it is worth it, but just 45 percent of Republicans agree. Forty-four percent of Republicans say it's not worth it. Among Tea Party supporters, 41 percent say the cost is worth it, while 46 percent say it's not. Overall, a majority of Americans, 76 percent, thinks government has the responsibility to provide health care coverage for the elderly, and 56 percent say the same for the poor. Once again, however, there are partisan differences. Republicans, at 55 percent, are less likely than Democrats (88 percent) or independents (79 percent) to say the government has a responsibility to provide health coverage to the elderly. Forty percent of Republicans say that's not the government's responsibility. Tea Party supporters, meanwhile, are split -- 47 percent say it's the government's responsibility, and 48 percent say it's not. Most Democrats (73 percent) and independents (61 percent) say the government has a responsibility to provide coverage to the poor, while just 25 percent of Republicans agree. Most Republicans (71 percent) and most Tea Party supporters (78 percent) say it's not. Given the choice to cut government spending on either Medicare, Social Security or the military, most Americans would prefer to leave Medicare alone - only 21 percent would cut it, while 45 percent would cut defense first. Seventeen percent would trim Social Security. That doesn't mean, however, Americans think Medicare will go untouched in future rounds of deficit-cutting. Most Americans - 57 percent - think it will be necessary to make changes in the program in order to lower the federal deficit. If Medicare does have to be cut, 48 percent of Americans are willing to go along. However, there are big differences by age group, and willingness to make cuts in Medicare declines as Americans get older. Americans are mixed on the idea of trying to reduce the deficit by changing Medicare to allow seniors to purchase private health insurance - 47 percent approve of the idea, while 41 percent disapprove. Among seniors, 55 percent oppose the idea, while most young people, who are years away from using Medicare, back it (53 percent). Yet most Americans - eight in 10 - say they are concerned changes to programs like Medicare or Social Security would impact Americans' ability to stay in the middle-class. Rather than cuts to Medicare, Americans would prefer that recipients pay more into the system, especially higher-income Medicare recipients. Fifty-six percent would rather see Medicare recipients pay more in taxes than have the benefits of future retirees cut. And 49 percent would like to see higher-income recipients pay more, compared to 24 percent who would raise the age Medicare recipients get their benefits, 11 percent who would raise premiums for all recipients, or 5 percent who would have fewer medical treatments covered. Will 2010 Medicare ads come back to haunt GOP? This poll was conducted among a random sample of 1,224 adults nationwide, interviewed by telephone April 15-20, 2011. The error due to sampling for results based on the entire sample could be plus or minus three percentage points. The error for subgroups is higher. An oversample of Republicans was also conducted for this poll, for a total of 543 interviews among this group. The results were then weighted in proportion to the average party distributions in previous 2011 CBS News and CBS News/New York Times Polls and in the random sample in this poll. The margin of error for Republicans is plus or minus four percentage points.